Blu, Culinariane and Fascino are perennial critic favorites. It's déjà vu for Montclair's Fascino, Culinariane and Blu. The three critically acclaimed eateries have once again made NJ Monthly's annual list of the Top 25 Restaurants in the state. The list was compiled by the magazine's critics and food writers and appears in the August 2013 Restaurant issue. Blu is the brainchild of chef/owner Zod Arifai. Diners have come to expect the unexpected from Arifai, who calls himself a "dinosaur", but is always changing things up with a six-course tasting menu and other specials. East of Blu and also in Montclair Center, Fascino, which turns 10 this year, features the food and desserts of son-mother duo Ryan and Cynthia DePersio. The restaurant recently re-opened after a renovation, and the family chose to close Bar Cara in Bloomfield to concentrate on Fascino. Ariane Duarte remains one of Montclair's "Top Chefs" with Culinariane, tucked away on Walnut Street steps from the train station. Duarte, a Verona native, told NJ Monthly her recipes are simple and she cooks food she wants to eat. All three chefs were recently featured in the second annual Montclair Food & Wine Festival. Eric Gurny, a Millburn High School grad, plans healthier options at newly purchased Maplewood Deli & Grille. After four years, Sean Flood has sold the Maplewood Deli & Grille in Maplewood Village. The new chef and owner is Eric Gurny. Born and raised in Short Hills and a Millburn High School alum, Gurny is a graduate of the Culinary Institute of America and has cooked in many restaurants in New Jersey and New York City. Gurny said he considers himself a real local and is thrilled to be in Maplewood. "We've been getting a lot of feedback from people and we have some changes planned," he said recently. Rest assured, Maplewood Deli & Grille fans (and yes, the name will remain the same), many of your favorites, including the Sloppy Joes and other items, will stay on the menu. Gurny said he wants to "consolidate" the menu a bit and offer some of his own, new creations. What to look forward to? Grilled panini, more signature sandwiches, fresh pulled pork sandwiches, and an atmosphere that is slightly less deli and more "bistro." "We'll have a lot of dishes with fresh ingredients, and some healthier food," said Gurny, who said he wants to emphasize the "Grille" a bit more than the "Deli." One of my most favorite events of the year in Maplewood is Maplewoodstock and last night we all had the privilege of listing to headliner Joan Osborne. Here are some of the highlights from her set. There is no doubt that the housing market is coming back nicely. What, if anything, could slow down the current momentum? We believe it may be sellers’ over exuberance when it comes to pricing. There is little doubt that house prices have appreciated over the last twelve months in most regions of the country. However, with both the inventory of homes for sale and interest rates increasing, we have to be careful to not over judge what the market can bare. No expert is expecting home prices to shoot up 18% in the next twelve months. 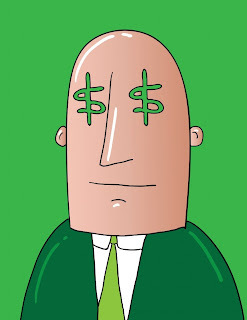 If anything, price appreciation may slow as rates and inventories increase. Investors will begin to slow their purchases and the first-time buyers expected to take their place will be working within a pre-set budget in many cases. Let’s look at an example: A young couple is looking for a home and have predetermined that their budget will only allow them to spend $1,000 a month on a mortgage. At today’s mortgage rate of 4.5%, they could afford a $200,000 mortgage ($1,013 principal & interest). However, if rates jump to 5%, they would have to lower their mortgage amount to $190,000 in order to keep their monthly payment where they need it ($1,020). At 5.5%, the mortgage would need to be no more than $180,000 ($1,022). This decrease in buyers’ purchasing power will have an impact on home values going forward. We do not believe it will cause a decrease in prices. However, we do believe it will likely cause current rates of appreciation to slow. If you are thinking about selling your home, don’t get carried away with current headlines about home price increases that have taken place over the last twelve months. Instead, call a local real estate professional. They will be best prepared to explain where prices are headed over the next six months. A rather unique way to cool off! Looking for a way to cool off from the heat and humidity? A nice slice of watermelon can do the trick. 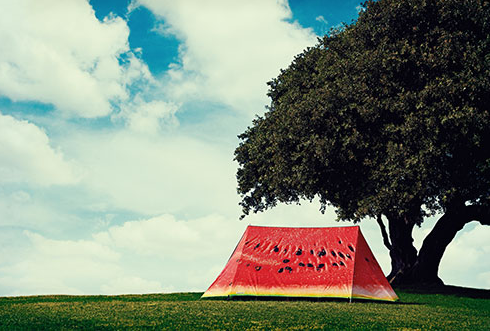 But how about a slice of watermelon so big you can sleep under it? 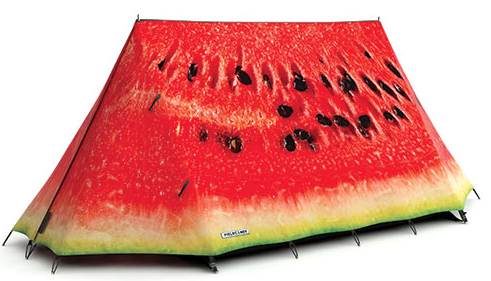 I saw this tent in the Styles and Vows section of today's NY Times and had to share. Independence Day will feature a full day of good, clean family fun—and a new location for the yearly fireworks display. 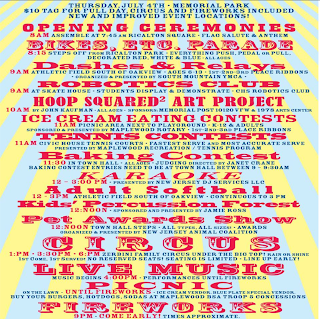 Maplewood's 111th annual Fourth of July celebration, organized by the July 4th Committee of the Maplewood Civic Association, is coming back to strike up the red, white and blue with fun, food, a circus and more for the whole family. And there is a twist this year: The fireworks show gets a new site—on the lawn in Memorial Park's Athletic Field, south of Oakview Avenue. Over a century ago, July 4 in Maplewood was celebrated with a town-wide picnic, a keynote speaker (usually a politician), athletic contests and barbecues. Citizens, generally in groupings by neighborhood, made their way to the picnic grounds. Informal processions gradually turned into elaborate parades with costumes and bands, becoming fierce (and expensive) competitions between neighborhoods. The July Fourth Committee was formed to unite the township activities. Eventually the Maplewood Civic Association was organized, encompassing the committee and dedicated to a tradition of family-oriented July Fourth celebrations. A $10 tag per person gets you entree to the entire day of activities, including the circus. Tags are available at the Town Hall Clerk’s Office, the Maplewood Memorial Libraries (both Main and Hilton branches), the Recreation Dept. at Town Hall and DeHart Park. Tags also will be for sale on July 4 in Memorial Park and at Evening Event Entrance Gates. 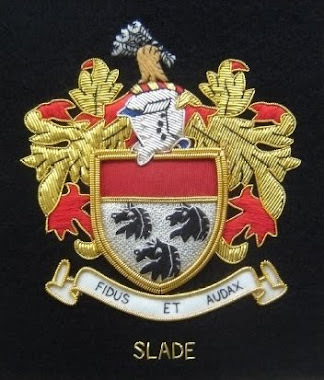 For agenda, tag sale locations and information go here; you can also visit the committee's Facebook Page to download a sign-up form and to look at some cool photos of Maplewood July 4ths present and past. For more information about volunteering, contact Howard Gilman at (973) 477-7687 or gilman.howard@gmail.com. 8:15 a.m. Parade steps off from Ricalton Park with everything you can push, pedal or pull; decorated red, white & blue; all ages. 11:30 a.m. Baking Contest in Town Hall; all ages. Judging directed by Janet Crane. Baking Contest entries need to be at Town Hall between 9 – 9:30 a.m.
12:00 noon to 3:00 p.m. Karaoke presented by New Jersey DJ Services LLC at Athletic Field, south of Oakview Avenue. Note that $10 per person tag is required for admission to the circus and to concert/fireworks spectator area. 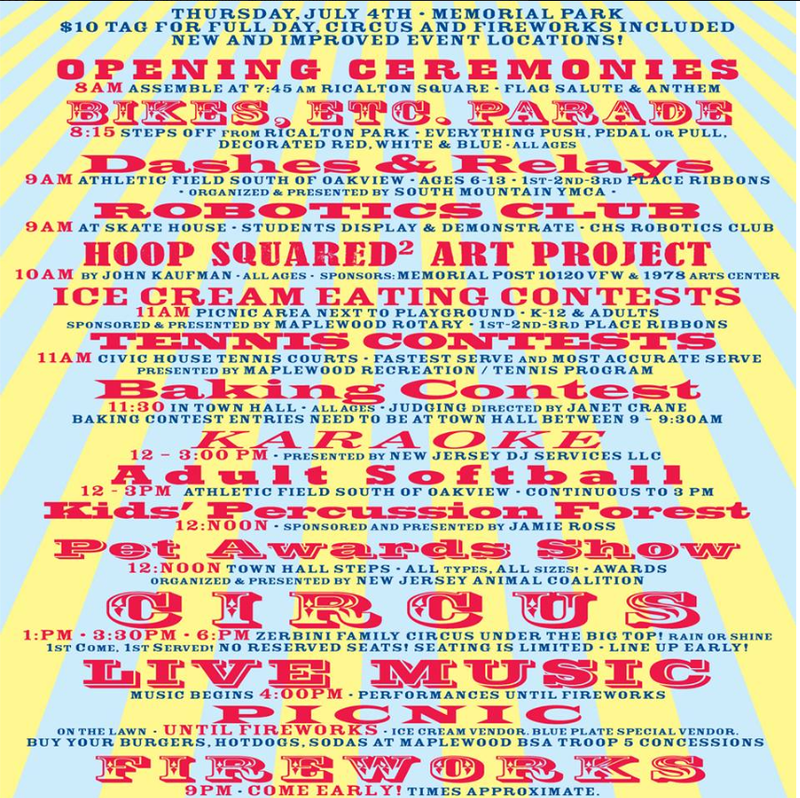 1:00 p.m. & 3:30 p.m. & 6:00 p.m. Zerbini Family Circus under the Big Top! Rain or Shine! 1st Come, 1st Served! No Reserved Seats! Seating Is Limited so line up early! Reading of Gettysburg Address by U.S. Grant Dietz, in commemoration of the 150th anniversary of the Battle of Gettysburg. 9:00 p.m. Fireworks — Come early! Times approximate. Parental discretion advised for small children and pets: consider viewing the very loud fireworks from a distance. Rain Date: July 5. (Circus and indoor events will be July 4, rain or shine). SPRINGFIELD AVENUE: Edo’s Quality Cakes, HLS Juice Bar & Grill, Park Wood Diner and on July 4th in Memorial Park and at Evening Event Entrance Gates. Registration is required for Bikes Etc. Parade and Dashes & Relay Races. Forms are available at Memorial and Hilton Libraries, Town Hall, online at Board of Education school websites (“Digital Backpack Flyers”), on Facebook "Maplewood 4th of July" and at www.maplewoodonline.com/cg/july4/.